Senior response to the Senior Hemp Tiny Homes project has been exciting! At the April 5 information meeting held at South Sound Senior Services in Olympia, more than fifty seniors came to learn more and share their support. On May 16 more than thirty seniors attended the Lacey Senior Services meeting. We now have more than eighty seniors working together to make this happen. Several have donated. Some offered to donate labor building tiny homes, others have building experience and tools to share. A team is coming together to: create tiny home villages; work on the building and learn; make tiny home kits; mud, tape, and paint; work to get codes changed in the cities and Thurston County to encourage and support tiny home permitting; offer land for tiny home villages; and for those with funds, to buy tiny homes. Judy Lennar shared the story of how she ended up living on $813 a month social security. She had worked since she was 15, but just at the time she decided to go back to school to study what she had always dreamed of, the 2007-2008 financial meltdown hit. She was never able to get a job again. Unable to pay her mortgage, she lost her home to the bank. She lived in a duplex, but when the owner died, she had to move. Most rentals require that a renter’s income be three times the rent. Not having that, she ended up moving into a tent in her son’s back yard until a kind person finally allowed her to rent without the first and last month deposits. “I do not have enough to buy a cup of coffee. 100 percent of my income goes to the cost of shelter. I long to have the security of an affordable home I own. It is difficult to move at any age, but especially difficult to be forced to move when you are elderly and on limited income. Recently, four seniors who plan to build tiny homes for themselves, visited the tiny home that Joseph Becker of ION Ecobuilding is building for his family. He showed the energy efficiencies he employed. They also watched Tanner Milliren working on his own tiny home he will finish before the end of May. Joseph and Tanner are developing designs for the prototype hemp tiny home and will help guide the building. According to Eileen McKenzie-Sullivan, Director of South Sound Senior Services, there is an affordable housing crisis for seniors locally. Rents average $900 to $1200 a month with requirements that the renter be receiving monthly at least three times the amount of the rent. Senior Services is conducting research to determine the scope of the crisis in a report due to be out in June. The situation only becomes more acute. Nationally, Americans aged 65 or over make up about 15 percent of the nation’s population. That ratio will increase to 20 percent, or from about 50 million to 70 million senior citizens, between now and 2030, as the last of the baby boomers reach retirement age. Affordable housing for seniors is a growing need. 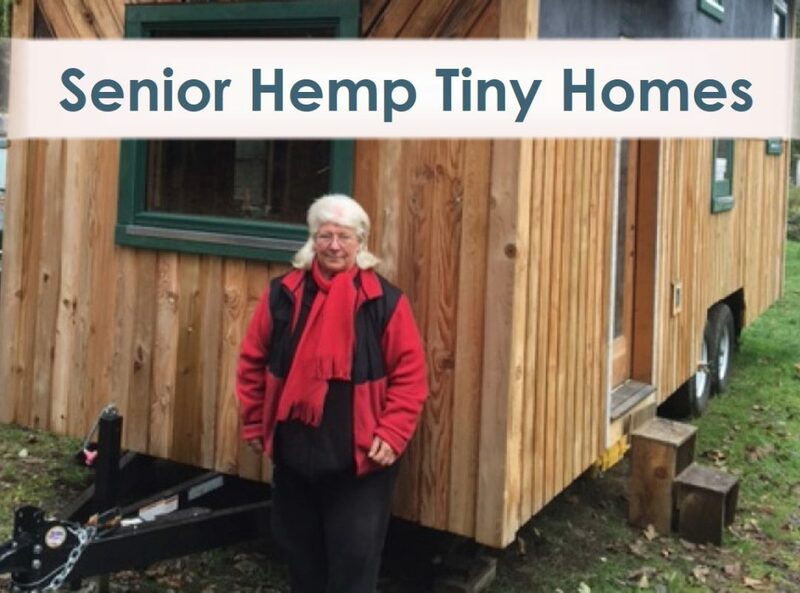 The senior hemp tiny home project offers a solution for many seniors. By building eleven tiny homes for eleven seniors, we will create a pathway for many more to be built. The Gofundme “Help Seniors Build Tiny Houses” can spread through social media to bring in the funds we need – share it everywhere. “Like” our Facebook Senior Hemp Tiny Homes. Donate through Paypal on our website. Checks can be mailed to Edible Forest Gardens, PO Box 13273, Olympia, WA 98508. All donations are tax deductible. Thank you for sharing the blogs with your friends, neighbors and contacts!